The Ocean Cleaner Project is an ocean advocacy service organization founded by open water swimmer Pia Lord. "The Ocean Cleaner Project develops machines which can clean up rivers, lakes, bays, coastal areas as well as open ocean areas to restore the planet to a more pristine state," explains Lord. "We handle clean-up projects of any size from small 2-hour ones to large scale 1-2 month or longer commitments of time, energy and resources. ​Our clients include private residential customers, towns, cities, coastal management organizations, governments and shipping, oil, and cruise liner companies." Lord is a seascape artist from Bloomfield, New Jersey who has completed the 7-mile Swim Around Lido Key (Florida), the 7.5 km Lake George Swim (New York), the 5 km Lake Wellington swim (Colorado), and the 4.4-mile Great Chesapeake Bay Swim (Maryland) as well as island-to-island crossings in the British Virgin Islands and coastal 5 km swims on Tenerife in the Canary Islands and in Mallorca, Spain. Lord has also written two open water swimming guides: Return to the Sea and Return to the Sea II. 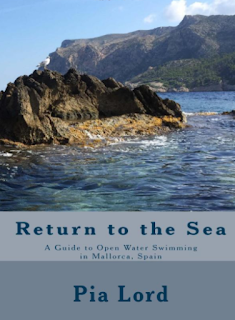 The Return to the Sea: A Guide to Open Water Swimming in Mallorca, Spain is a guide book to open water swimming on Mallorca where key concepts in preparation, safety, and equipment are covered. "Along the coastline of Mallorca, there are exciting easy, intermediate and advanced open water swims. Return to the Sea is a guide book to discovering the profound power of open water swimming in connecting with the planet." Kayak, Kleanups n Koffee is a MeetUp group that Lord recently established to promote clean waterways. "We are an environment friendly group of people interested in doing our part in assuring clean trash-free waters while having fun kayaking. We kayak a set distance and if we see plastics along the way, we pick them up and bring them ashore. We log them and recycle or properly dispose of them." For more information on Lord's Ocean Cleaner Project, visit here. For more information on her Return to the Sea, visit here. For more information on Kayak, Kleanups n Koffee, visit here.